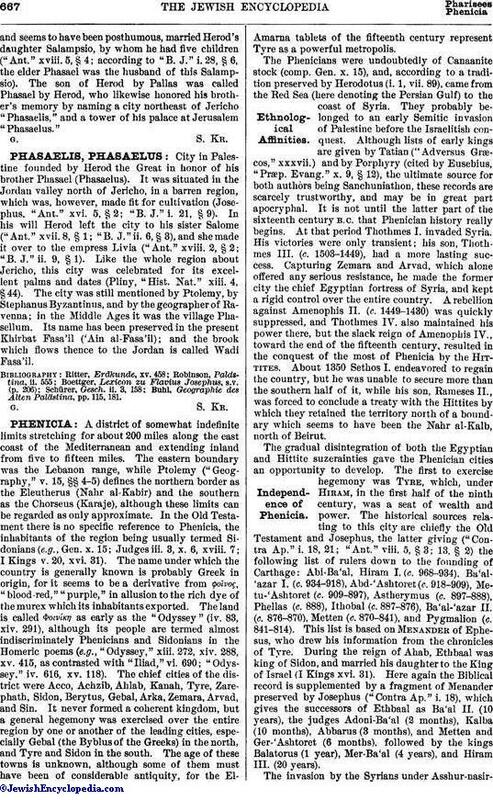 City in Palestine founded by Herod the Great in honor of his brother Phasael (Phasaelus). It was situated in the Jordan valley north of Jericho, in a barren region, which was, however, made fit for cultivation (Josephus, "Ant." xvi. 5, § 2; "B. J." i. 21, § 9). In his will Herod left the city to his sister Salome ("Ant." xvii. 8, § 1; "B. J." ii. 6, § 3), and she made it over to the empress Livia ("Ant." xviii. 2, § 2; "B. J." ii. 9, § 1). Like the whole region about Jericho, this city was celebrated for its excellent palms and dates (Pliny, "Hist. Nat." xiii. 4, § 44). The city was still mentioned by Ptolemy, by Stephanus Byzantinus, and by the geographer of Ravenna; in the Middle Ages it was the village Phasellum. Its name has been preserved in the present Khirbat Fasa'il ('Ain al-Fasa'il); and the brook which flows thence to the Jordan is called Wadi Fasa'il. Buhl, Geographie des Alten Palästina, pp. 115, 181.